From Software's line of Soulsborne games are an acquired taste, to say the least. On the one hand, the barrier of entry is extremely high. It's not for the impatient. It's not for those who want a leisurely story-based stroll or a mindless button masher. These games will make you work to overcome their challenges. Having said that, actually completing those challenges is among the most satisfying feelings in modern gaming. It's practically a badge of honor. So does Sekiro: Shadows Die Twice, From Software's first collaboration with publisher Activision, maintain that atmosphere, even with a whole new story and new mechanics? Today, we revisit our Shacknews review and take a look back at what we thought of this Samurai slasher. We'll put it alongside reviews from across the gaming world, as well as platform-specific outlets. Take a look and judge for yourself whether Sekiro: Shadows Die Twice is a challenge worth setting out to conquer. Shacknews 9/10: "Sekiro: Shadows Die Twice stands tall among some of From Software's most renowned titles. The challenge is clear and present, the story and mystery are equally intriguing, and the beautiful vistas and soundtrack work in perfect harmony. It might be entirely different to what came before it, but Sekiro: Shadows Die Twice is a near-perfect experience and a natural progression of the Soulsborne series." Game Informer 9/10: "Sekiro's story moves in strange and compelling ways that defy the initial adherence to the trappings of feudal Japan, and allows the player to discover multiple endings and confrontations depending on choices and secrets. It's a challenging journey through a weird and wondrous world that forces you to learn and master its punishing combat to succeed. However, the sweet thrill of victory keeps you pushing forward despite myriad disheartening deaths. Sekiro is one of the most difficult games I have ever played, but for those seeking adventure, exploration, and a truly realized ninja fantasy, the trek is worth the high demands." IGN 9.5/10: "Sekiro evolves From Software’s formula into a stylish stealth-action adventure that, naturally, emphasizes precision and skill in its combat. It walks the line between deliberate and patient stealth and breakneck melee combat against threats both earthly and otherworldly. Its imaginative and flexible tools support a more focused experience that shaves down some of From Software’s overly cryptic sensibilities without losing its air of mystery. Sekiro is an amazing new twist on a familiar set of ideas that can stand on its own alongside its predecessors." Destructoid 9/10: "Sekiro: Shadows Die Twice innovates to the point where people who are tired of the same old song and dance will find new mysteries to master, but still maintains that strong marriage of world building and sense of pride garnered from besting taxing conflicts. It's another keeper so long as you're ready to strap in for a tough ride." 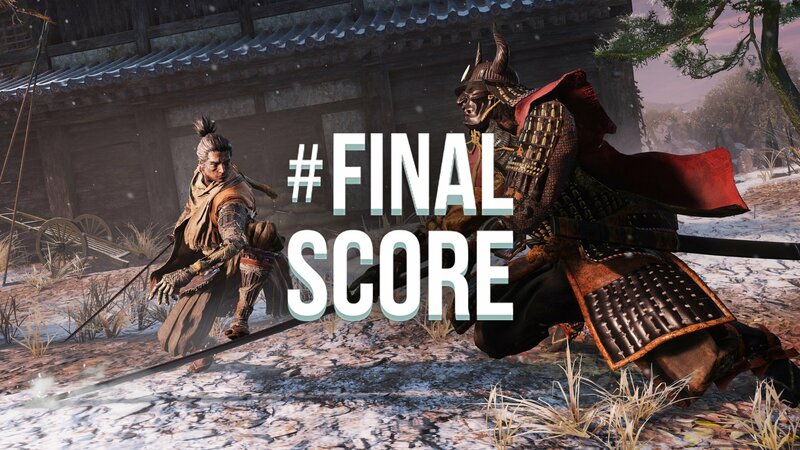 PCGamesN 9/10: "It has been a privilege to play Sekiro. It’s more sensitive to your own skill than any of its predecessors in ways that are at first enfeebling, and then empowering. It’s a shame that this experience has to come at the cost of difficulty that will limit its audience, because it deserves to be enjoyed by everyone. But better that than compromise any part of it." PlayStation Lifestyle 9.5/10: "Untethered from the expectations that come with a Dark Souls or Bloodborne game, FromSoftware was able to create a game that maintains the studio’s unique identity while allowing them to explore interesting new mechanics and ways of telling the story. Sekiro is challenging, but fair—a game with the goal of allowing the player to grow, rather than the avatar. It blends mechanics and narrative in a way that is too rare in games today, allowing for a deep level of immersion that begs for just one more clash of blades no matter how difficult the encounters get. Seeing each one to its bloody finish is well worth the trials it takes to get there." Xbox Achievements 90/100: "There's no disputing that Sekiro is an excellent video game. It's fiendishly difficult, supremely stylish and no other game out there grants the kind of satisfaction you'll feel after you defeat a boss who at first you never thought'd you'd be able to beat. That evolution from facing insurmountable odds, to cutting your opponent down with ease is one that is unrivalled in video games. It still boggles the mind though that after ten years and five games there are still the same persistent camera issues, instances of clipping, and that wonky lock-on system present in every FromSoftware game. Aside from that, Sekiro: Shadows Die Twice is FromSoftware's most stylish title, one that oozes class and flair from the moment you pick up the controller to the moment you embed that very same controller into the drywall." Sekiro: Shadows Die Twice is available now on PC, PlayStation 4, and Xbox One. If you decide to give it a try, you're probably going to die many, many times. You'll probably need some help, so keep an eye on our continuing guides and coverage.